The Russian Federation and its predecessor, the Soviet Union, is universally known as a juggernaut in the sport of ice hockey. The Soviet Union in particular won nearly every international tournament they participated in, and never failed to win a medal in the Winter Olympics from 1956 until the collapse of the Soviet Union. Afterwards, Russian players have continued to stream into the NHL in North America and are among some of the best and most recognized names in the league, including such superstars as Alexandr Ovechkin and Evgeny Malkin. Russia’s history of the sport contains an interesting history with a near immediate blitz to the top, where it continues to remain to this day. The first attempts to develop ice hockey in the USSR, as we know it today, began in the 30s. Prior to this, and perhaps even for centuries, Russians mostly played bandy or a variation thereof. Bandy a game similar to hockey but which uses a ball instead of a puck, and has a few more slight variations to the ice and it’s rules. At this time, ice hockey was called “Hockey with Shaiba”, which is the Russian word for puck. Ice hockey and its rules was first written about in 1927 in the “Bulletin for Physical Education” and was suggested to be introduced as a game of leisure for peasants, farmers and factory workers alike. However, it still took some time for the game to catch on. There was an internal championship held in 1947 for the game, with a match between Moscow “Dynamo” and the central club of the army “CSKA”. CSKA was led by two in particular: the young player-coach Anatoly Tarasov, who is known as the “godfather” of Russian ice hockey and Vselovod Bobrov. Anatoly Tarasov would go on to lead and coach Russian olympic and international teams, and mentor players throughout the country. After serving during the Second World War, Bobrov began his athletic career, initially for soccer, and he also played for the Army’s team, and was selected three times to represent Russia nationally, including a tour in England playing against such teams as Chelsea and Arsenal, during which he scored three goals. Not only that, but he became one of the Soviet Legends of hockey, scoring 89 goals in 59 games! During this time in the 50s, the Soviet team played throughout Europe against the Czechs, Swedes, and others with incredible success. In Vienna in 1953 there was a series of games held for students, and the Soviets won all of their games. In 1954, an international championship was held in Sweden, and while the Soviets were considered underdogs, they spectacularly routed the revered Canadian team, beating them 7-2, who was represented by the team of East York. Afterwards, the Soviet team, including player-coach Tarasov, were invited to play eight friendly games in Montreal at the legendary stadium, the Montreal Forum. Here the Russian team and Tarasov were able to gain invaluable insight into the origins of the game and their greatest players in Canada. The Soviet team impressed the Canadians by winning five of these games, losing two, and drawing one. Here the differences in style was quite obvious. The Canadian game of hockey was much more rough, spirited, and perhaps even more emotional, while the Russian emphasis was on skating, passing, and team play. Tarasov favoured a system in which each player played and specialized in his own position on the ice, rather than a universal ability to play any position, and thus the system of “Fives” was created, so each player knew his position and the talents and failings of his teammates on the ice. This system would remain in place for the rest of the life of the Soviet Hockey Team. It wasn’t until the Soviet admission into the International Olympics Committee that popularity of the game really took off in Russia.ort was a matter of pride, and the decision was made to invest in the sport to help the USSR become the number one nation in hockey. The Soviet ice hockey team made their debut in the 1956 winter Olympics in Italy and immediately won the gold medal. The Soviet Union was now a force to be reckoned with! However, after this spectacular victory, the Soviet team was unable to continue with their international success for another six years. Indeed, their tried and tested star players were getting older, and so a new generation of players made their debut, and Tarasov was able to create his ideal team from scratch. From 1963 onwards the Soviet team won every international championship and two olympic gold medals. Moreover, it was in 1968 when Tarasov first saw a fifteen year old kid who would later become a worldwide sensation and hockey hall of famer: Vladislav Tretyak. Still to this day known as one of the greatest goaltenders of all time, and who commands the adoration of his Russian fans, and the utmost respect of his competitors around the world. 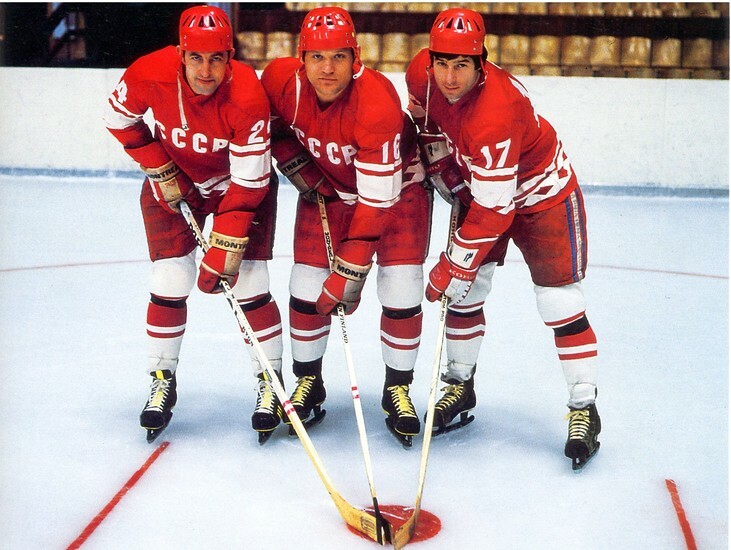 The 70s was both the most successful and perhaps most iconic for the Soviet hockey team, in addition to being the foundation for their rivalry with Team Canada. Between 1970 and 1979, the USSR won seven world championships and two Olympic gold medals. 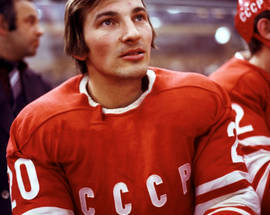 This was also during the reign of the greatest Soviet legends of all time – Valery Kharlamov. 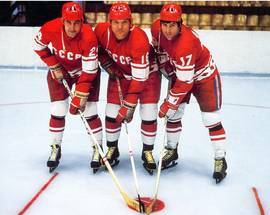 Playing together with Boris Mikhailov and Vladimir Petrov, they formed one of the most effective forward lines in the history of hockey. 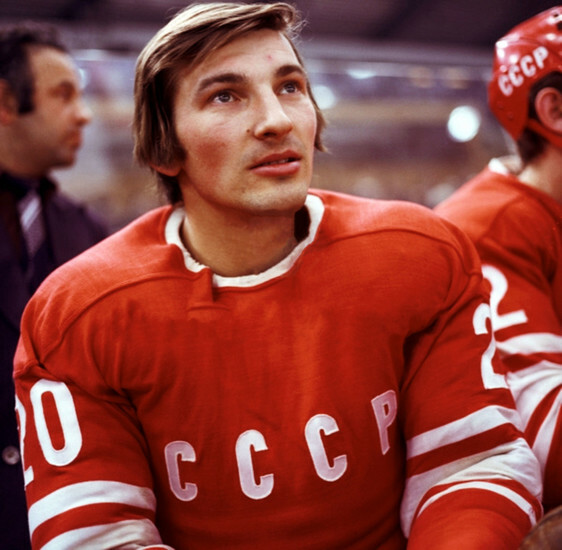 The incredible success of the early 70s and Tarasov’s fresh, young, and dynamic roster convinced him that the Soviet team was now ready to take on what was considered to be the best in the world: the Canadian professionals. Prior to this, due to regulations and rules laid out by the International Ice Hockey Federation, professional hockey players (those playing in the NHL) were disqualified from competitions, and so up until this point, those playing in the NHL had not competed in the Olympics or World Championships. Understandably, this led to the Canadian team being underrepresented, and the Canadians, having lost international competitions, were still completely convinced that Russia had yet to face off against their best, and thus Canada was still the greatest. Now it was time for the ultimate clash, to settle once and for all who was the dominant force in world ice hockey! The clash of the titans took place in 1972 in the now legendary Summit Series. The 8 game series was agreed to be held in both Canada and in Russia: the first 4 in Canada in Montreal, Toronto, Winnipeg, and Vancouver, and the remaining 4 games to be played exclusively in Moscow. Frankly speaking, the Canadians had a sense of arrogance during the negotiations, and were very sure they would win every game, and so it was decided that the rules and referees would be according to the European style, rather than North American, which has a few distinctions. Ironically, Tarasov was replaced as coach for the Soviet team by Vsevolod Bobrov, who also had experience playing against the Canadians previously. The Canadian media and those involved were absolutely certain of their imminent victory, and believed Canada would sweep the series. In the end, fate came with a tinge of irony as the Soviets utterly humiliated the Canadian team in Montreal during the first game, defeating the Canadians 7-3 and sent the public reeling. This tournament, being held during the height of the cold war, was seen a peaceful means for either side to display themselves the better of the two, and the series was taken extremely seriously. The pride of their respective nations were on the line! After the games in Canada were complete, the Soviets stood at two wins, one loss, and one draw. After the Soviets won the first game in Moscow, Team Canada went on to win the next three and take the series, with Paul Henderson scoring the now almost mythological goal to win the series. Since then the series has become an important part of Canadian culture. Despite some problems with the series, its organization, allegations of foul play and other hiccups along the way, the one thing that was unequivocally demonstrated by the series was that neither Team Canada, nor the USSR was an invulnerable force on the ice. The Soviet Union had earned the respect of the revered Canadian hockey team and their viewers back home. However different their styles of play may be, they proved to be an equal and exciting match for one another, and this rivalry continues to this day. 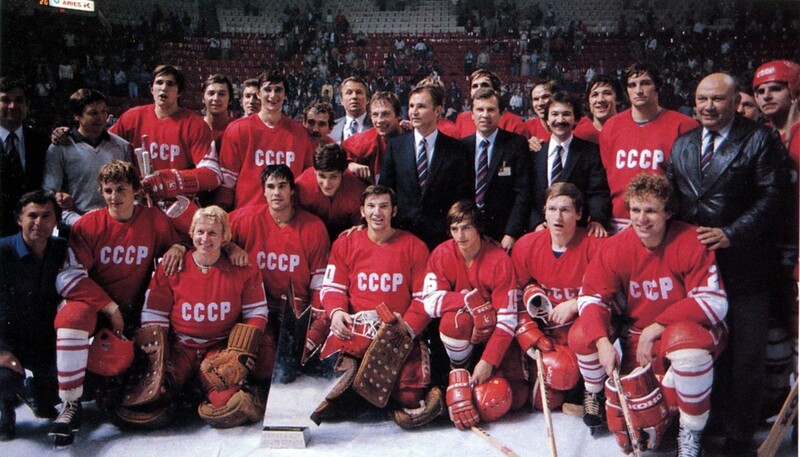 The Soviet team went on to win world championships in 1973, 1974, 1975 and 1976. In 1977 they placed bronze at the championship in Vienna, and though it was still a medal, the Soviet leadership deemed it shameful, and Tarasov was forced to retire. He was replaced by Viktor Tikhonov. Tikhonov became the leader of a new generation of Russian hockey players, such as Vyacheslav Fetisov, Igor Larionov, Vladimir Krutov, Alexey Kasatonov, Pavel Bure, Alexander Mogilny, Valery Kamensky, several of whom would go on to later play in the NHL. 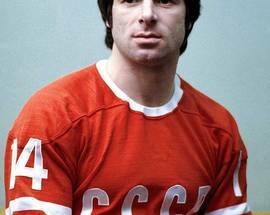 In 1981, the country experienced a shock at the tragic and untimely death of their superstar and hero Valery Kharlamov in a car accident, dying alongside his wife and her cousin while colliding with a truck. The entire nation mourned their loss, and fans lined the streets for his funeral procession, shuffling past his casket which laid at centre ice of the CSKA arena in Moscow for the fans to pay their respects. 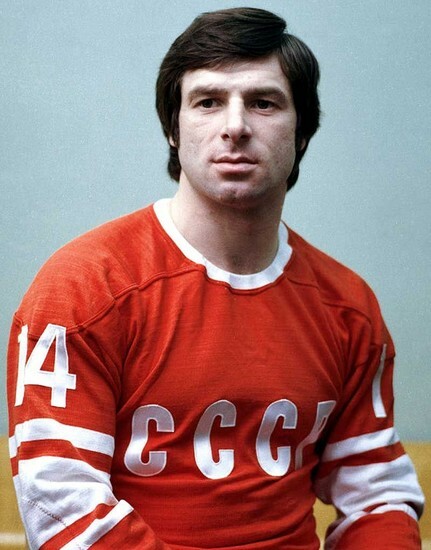 After his death it was forbidden for any player for the team of CSKA to sport the number 17. 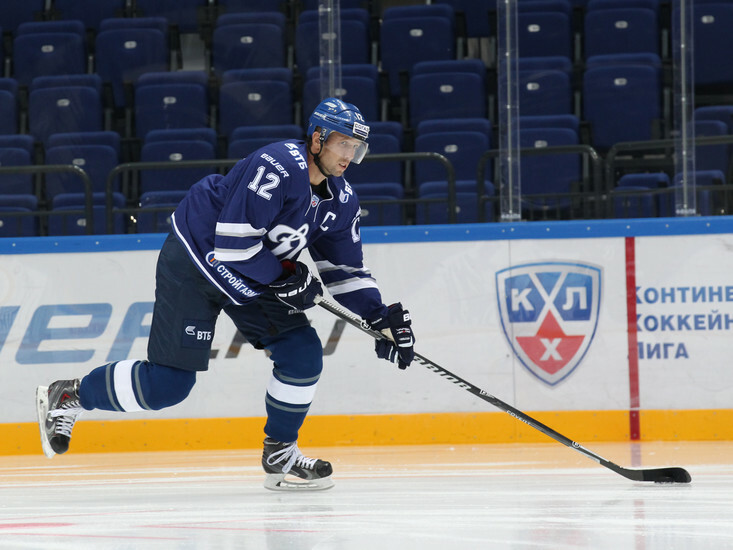 One exception was made, however, when Kharlamov’s son joined the KHL and played, sporting his father’s number. Slava Fetisov, Alexey Kasatonov, Sergey Makarov, Igor Larionov and Vladimir Krutov, during the 80s, formed what was known as the “Russian Five” or “Green Unit” (due to the shirts they wore during practice) which dominated Russian national hockey and the international stage during the 80s. Fetisov became the captain and lead the team to victory after victory, one of note being winning the Canada Cup in 1981. The USSR beat the Canadians with a staggering score of 8-1. Also noteworthy that the great one, Wayne Gretzky was even playing during this game. 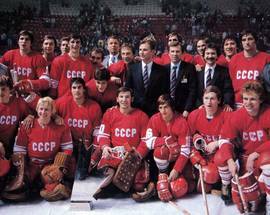 This was the first and last time that the Soviet Union won the Canada Cup, however the Russian Five continued to win, and took the 1982 and 1983 world championships. It seemed the sky was the limit for this new lineup of Russian hockey and no team could match them. In the final tournament of the great Tretyak, the 1984 Olympics in Sarajevo, the Russian team again took the gold. In 1987, rather than the traditional all-star games played in the NHL, the Soviet team was invited to Quebec to play a series of games against the NHL all star team. While this was not as competitive as is typical for international hockey, it was still a spectacle and regarded as a landmark event in the world of hockey. It fostered better sympathy and relations between the nations and was touting as a huge success. Across political and social lines the mutual love of the game was elevated above all else. In addition, the arrival of the Russian team brought out many fans, supporters, and viewers who wished to see the Soviets play, and in the end over $350 000 was raised for the NHL pension fund. The NHL all-stars took the first game 4-3 and the Soviets the second 5-3. Again, the greatness of both Soviet and NHL hockey was on display, and sportsmanship, respect, and the sport itself was the winner of this event. From 1989 onwards, there was a massive influx of Russian hockey players into the NHL. Due to the instability of the country at home, funding for sports culture and programs dried up, and for many it was an easy choice, and their only chance, to escape from a potentially dangerous situation at home. Many chose instead to live the life of a professional athlete in the United States or Canada, which is, as we all know, almost like royalty! Players like Pavel Bure, who went to the Vancouver Canucks, Sergey Federov to the Detroit Red Wings, and Alexander Mogilny to the Buffalo Sabres. After winning the world championships in 1993, more than 10 years passed without winning any significant competitions for the Russian team. Perhaps during this period, the difficulty and instability of the 90s was felt, as funds and management were not as present as they were previously. Only in the year of 2008 did the Russian again reclaim the title of World Champion, only to be followed by a second win over Canada in 2009. The period of poor performance had come to an end! The cream of the crop of Russian hockey continue to this day to play for major NHL teams, such as Alexander Ovechkin. Stars like him show, that although Russian players still dream to play in the NHL, their upbringing and development in Russia prove that the country still produces world class athletes and hockey superstars. Not only that, but the KHL, Russia’s main hockey league and potential competitor continues to grow in significance and help the game to regain in popularity that was lost in the 90s. 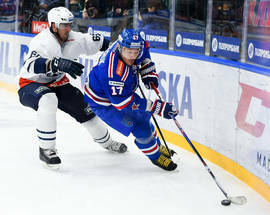 Furthermore, reversing the trend of emigration was the NHL lockout, which saw many players, and not only Russians, coming to Russia to play for KHL teams.This resulted in KHL hockey games being broadcasted in the United States and Canada, further sharing the game between the nations. 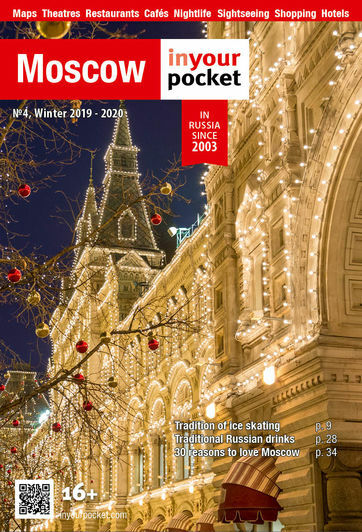 The history of Hockey in Russia is a bright and glorious one, with a few tragedies, but many victories, and one that seems set to continue on its brilliant path into the future. Russian hockey will forever be a challenge and worthy rival to those other countries in the world to whom hockey is an important part of life. Competitiveness, sportsmanlike behaviour, and a true love for the game not unlike that shown in Quebec in ‘87 is what we all hope for and look forward to in the future ice hockey.